Christmas greetings from Empowering Learners. We hope your holidays have been well spent with loved ones. Our days at the Peterson household have been full of hospitality, conversation, and planning. One guest bedroom is already in a state of readiness as we begin our journey preparations. We’re setting aside warm weather attire, travel-size products, camera bags, etc. Exactly two weeks from today we will be landing in Windhoek, Namibia, after 41+ hours of travel. The emails and texts from our friends and colleagues in Namibia are increasing steadily as the dates near for our journey. And so, we prepare, and we pack, and we make ready, and we anticipate. How will this trip differ from the others? Who will we meet and what new relationships will we encounter? What is the state of the drought in the North – now going on three years? We prepare and we wait. One of the delightful benefits of this Christmastime is the annual influx of Christmas cards and letters. What a treat it is to refresh my cup of coffee and settle in to read the mail of the day. And, what a treat it is to also open envelopes of gifts sent in support of Empowering Learners. My colleagues in Lutheran higher education fundraising know that I often speak about the discipline of giving – about giving as a learned habit and about the seasonal-ness of generosity. How lovely it is to also be on the receiving end of this learned behavior! Many of you know – due to my professional transition back to serve my alma mater, Gustavus Adolphus College – that I needed to tap the pause button on this very worthy project. During this now two-year transition period, I realized I simply did not have the emotional bandwidth to keep pushing this project forward. But to my happy surprise and delight, many donors stayed tethered to the work of Empowering Learners, and the gifts kept coming. Thank you friends and family. You have been a buoy to me. This was the view on the Third Sunday of Advent as I sat at our dining room table writing thank you notes and sending receipts. (And yes this posting should have gone up ten days ago. So it goes!) To all of you who continue to support this project with no prompting to give – please know your gifts are being put to immediate good use. I am learning from your cards and letters that for many of you this is your Advent discipline and I remain deeply grateful. 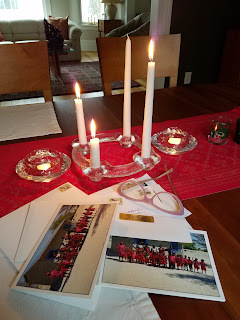 From Advent to Africa. Merry Christmas dear friends. Blessings to you and yours.